Nothing is worse for a columnist than boring cases. With precious few family opinion coming out of the Wisconsin appellate courts, I thank the Court of Appeals for its recent decision in Heppner v. Heppner, No. 2008AP2020 (Wis. Ct. App. May 5, 2009) (recommended for publication). In the case, as discussed last week, the Court of Appeals, in a decision written by Judge Ralph Adam Fine, held that, by ending maintenance in approximately four years in a 32 year marriage, the trial court erroneously exercised its discretion. Nothing surprising about that ruling. However, rather than remanding the case for reconsideration or additional findings, the Court of Appeals, under Wis. Stat. § 808.09, modified the trial court’s order by extending maintenance for an indefinite term. Second, the Court of Appeals held that the trial court’s refusal to include stock-option income in the pool for maintenance was an error of law and, accordingly, an erroneous exercise of discretion – despite the fact that the stock options were “under water,” and a prior Court of Appeals decision allows the exact ruling reach by the trial court. Finally, the Court of Appeals held that the trial court erroneously exercised its discretion by excluding the options from division because it erroneously viewed their potential value as being almost solely a function of what John Heppner would do in his business after the divorce, and largely ignored the fact that the options were earned while the parties were married. The case raises a number of serious questions, not the least of which is, whatever happened to trial court discretion? OK, four years of maintenance in a 32 year marriage might take a lot of explaining. But instead remanding the case to the trial court for such an explanation, the appellate court remanded the case with express directions to order indefinite maintenance. Does this holding mean that in every 32 year marriage with a disparate income, the trial court has to order indefinite maintenance as a matter of law? Next question: Is the phrase “…she is entitled to maintenance even though Mr. Heppner is retired” in (¶15) dicta? If would seem so, since Mr. Heppner was very much not retired at the time of trial (his extreme work habits being one of the bases for the trial court’s decision). If this phrase is not dicta, however, it is the first holding ever in Wisconsin on the effect of retirement on maintenance is not a permanent annuity. 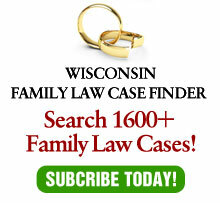 Johnson v. Johnson, 217 Wis. 2d 124, 576 N.W.2d 585 (Ct. App. 1998). If this phrase is part of the holding in the case, and not just dicta, is the trial court deprived of discretion (see question #1 above) to terminate maintenance when the payor reaches a normal retirement age? Next, is Maritato v. Maritato, 2004 WI App 138, 275 Wis. 2d 252, 685 N.W.2d 379, good law? Or, as it appears, has the Dist. I Court of Appeals overruled the decision of another Court of Appeals district? Maritato, which might be the best researched and reasoned decision ever (full disclosure: It extensively cities an article I wrote), held that a trial court has the discretion to find that underwater options have no value. In Heppner, despite giving the holding in Maritato lip service, the appellate court reversed the trial court for finding exactly what Maritato allowed it to find. Besides asking what happened to judicial discretion, what happened to stare decisis? Perhaps of greatest concern is the rejection by the appellate court of any discretion by the trial court to find that including the (worthless) stock options for property division and maintenance would be impermissible double-counting. The court held that the principle prohibiting double-counting does not apply to income from assets. Still, stock options are an unusual combination of property and income depending on the timing of when they are exercisable and their value at that time. Again, the appellate court — perhaps mistakenly thinking that it was really a trial court — refused to find that excluding the options from maintenance was even within the trial court’s discretion. Stock options are not common assets; most divorcing parties are lucky if they own any stock, much less stock options. Maintenance, however, arises far more often and consideration of different sources of income is not uncommon. Isn’t the trial court, which heard the evidence and assessed the credibility of the parties, in the best position to exercise discretion and fashion orders suited to the circumstances of each individual cases? Reading Heppner, the answer, contrary to what many thought was established law in Wisconsin, appears to be no.